Bedding foam used to construct mattresses or mattress toppers come in a variety of materials, each with different pros and cons. The best type of bedding foam to buy depends on the personal needs and preferences of the person sleeping on it. Comfort layer - The foam materials used in this layer react to body heat, molding and contouring to the shape and eliminating pressure on joints. 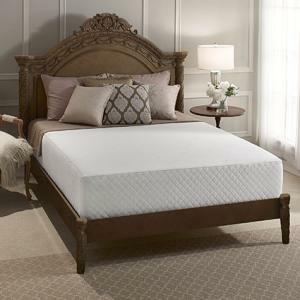 Support layer - This layer is more rigid, helping retain the shape of the mattress and supporting the comfort layer. Base layer - This is the thickest and most rigid layer as it supports the top two layers. 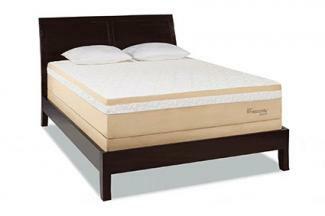 Various sublayers may also be present depending on the mattress design and manufacture. Not all memory foam is alike and it can vary greatly in price and quality. Understanding the difference between the three common types of memory foam can help you decide which one will suit you best. Originally designed by NASA, traditional memory foam, also referred to as standard or visco elastic foam, is made from petroleum-based polyurethane. The foam is heat reactive, softening as it warms up and contouring to the shape of your body when you lay on it. The first company to use standard memory foam in commercial bedding was Tempur-Pedic. Pressure point relief - This foam helps distribute weight more evenly across the surface of the bed, reducing pressure on shoulders and hips. Motion isolation - Movements made on one side of the bed don't affect the other side of the bed. Widely available - Visco elastic memory foam has been available since the early 1990s and can be found in most local showrooms. Heat retention - As the material conforms around your body, it tends to retain heat, making some users feel uncomfortably warm. Off-gassing - The chemical composition of the mattress releases an unpleasant odor that can last from a few days to a few weeks. Contains petroleum and VOCs - Volatile Organic Compounds easily evaporate at room temperature and can cause certain health risks. Price - Top end products can be very expensive. If a memory foam mattress is out of budget, consider upgrading your current mattress or a less expensive mattress with a memory foam mattress topper. Tempur-Pedic offers a 90 day in-home trial for their mattresses which come with a 10 year warranty. The newest version of memory foam is infused with gel. The gel is intended to help reduce the retention of heat, creating a type of memory foam mattress that sleeps cooler. It is still made with visco elastic memory foam infused with tiny gel beads. Cooler - Infused gel beads bond with the foam, allowing more air flow to regulate the mattress temperature. Supportive - The gel adds strength to the mattress, so you sink in less deeply. Motion isolation - Gel memory foam has the same minimal motion transfer as standard memory foam. Availability - Major brands such as Serta and Brentwood have made gel foam mattresses easy to find. Off-gassing - Because it is made with the same materials as standard memory foam, VOCs and chemical odors are still present. Serta's iComfort line of gel memory foam mattresses come in all standard sizes. In an effort to cut down on the unsavory chemicals used to make memory foam, some manufacturers have replaced a portion of those elements with plant extracts. This can vary by the manufacturer but common materials include soy, aloe vera and bamboo. Cooler - Extreme open cell technology improves air flow and helps dissipate heat faster, as much as 10x faster than traditional memory foam. Pressure point relief - Natural memory foam performs like visco elastic memory foam, distributing weight evenly and offering pressure release from sensitive joints. Motion isolation - Natural memory foam prevents motion transfer the same as visco elastic foam and gel foam. No off-gassing - Manufactured with zero emissions, natural memory foam has no VOCs and does not emit unpleasant, toxic odors. Allergy relief - The solid core of a natural memory foam mattress won't accumulate dust mites and their feces the way a hollow innerspring mattress does and the natural materials are better for sensitive skin. Harder to find - Natural memory foam is more of a specialized product that you might not be able to find in a local show room. Price - Organic materials and eco-friendly manufacturing processes typically result in a higher price. 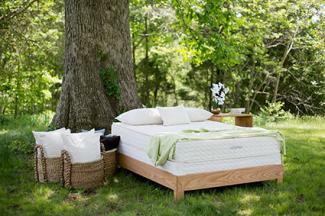 My Essentia offers natural memory foam mattresses in all standard sizes made from rubber tree sap. Latex foam used in mattresses and mattress toppers can be natural, synthetic, or a blend of both. In an effort to produce a more consistent latex with benefits from both materials, manufacturers began blending natural latex with synthetic latex. Mattresses made from all-latex, whether it is natural, synthetic or blended, offer superior orthopedic support, making them an excellent choice for back pain relief. Synthetic latex or synthetic rubber is a type of polymer developed from Styrene and Butadiene. Synthetic latex has the same cell structure as natural latex yet has more strength. However, it lacks the elasticity or softness of natural latex. The chemicals in synthetic latex act as catalysts and are washed out or disappear at the end of the manufacturing process. 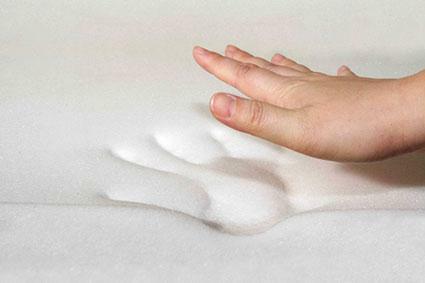 Blended latex foam is made using the Dunlop or Talalay process, which is also used in 100% natural latex. Blended Dunlop latex uses the purest form of natural latex (40% of the extracted sap from the rubber tree) in the core. Most Talalay latex is a blend of 70% synthetic and 30% natural latex. Cost - Synthetic and blended latex mattresses are less expensive than all natural latex while still offering good support and pain relief. No VOCs - All-latex mattresses don't have the off-gassing effects associated with memory foam. Motion isolation - Latex foam prohibits motion transfer. Uncommon - Synthetic all-latex mattresses can be hard to find as most manufacturers are using blended formulas. Less elastic - Synthetic latex is not as elastic or soft as natural latex. Sleep EZ offers layered latex mattresses with three inch layers of natural Dunlop or blended Talalay latex. Natural latex foam is made from the sap of the Para rubber tree and is manufactured using the Dunlop or Talalay process. Each process results in a different type of latex foam. The only manufacturers supplying retailers with 100% natural Talalay latex are Radium Foam and Latex International. The natural latex bedding experts at Savvy Rest came up with suggestive descriptions of Dunlop and Talalay latex foam that helps put the difference between the two into better perspective. Dunlop - Dunlop latex is denser and more supportive than Talalay. The liquid latex is poured into a mold and baked. Sediments in the mixture settle to the bottom and are baked in, therefore making the bottom layer slightly denser and firmer. Think of Dunlop latex like pound cake. Talalay - Talalay latex is softer than Dunlop. After the liquid latex is poured into the mold, it's sealed and the process is completed in a vacuum environment. The molds are also flash frozen before they are baked. These two extra steps create a very even consistency, giving Talalay latex a consistency similar to angel food cake. When choosing a natural latex mattress topper, look for Dunlop latex if you need to improve your mattress's support or firmness. If your mattress feels too hard, Talalay latex will make it feel softer and cradles your body similar to memory foam. Versatile - Different manufacturing processes result in support and firmness or softness and comfort depending on your needs. Strong - Natural latex is a very durable and stands up well to everyday use. Allergy relief - Naturally resistant to allergens and dust mites, natural latex is free from toxic chemicals. Cost - Natural latex is more expensive than synthetic latex and most memory foam. Talalay is the most expensive to produce and it is reflected in the price. Allergy risk - Some people are allergic to latex. Savvy Rest offers mattresses with three layers of three inch natural Dunlop or Talalay latex (sourced from Radium Foam) in varying levels of firmness, covered in organic cotton and wool casings. Some mattresses are a layered blend latex foam and visco memory foam. In some cases, a thinner top layer of latex foam rests on a thicker base of visco memory foam. Other mattresses are opposite, with a thicker latex-base foam under a thinner visco memory foam. Blended foam mattresses are less expensive than an all-latex mattress while still providing excellent support or helping to reduce joint and back pain. Cost - A mattress layered with latex and memory foam is less expensive than an all-latex mattress. Off-gassing - The memory foam component of a layered latex and memory foam mattress will still produce off-gassing odors. Casper mattresses are designed with cool, hypoallergenic latex foam on top of a memory foam base. Commonly used in hospitals and nursing homes, convoluted egg crate foam mattress pads offer an inexpensive solution for adding comfort to a standard mattress. The name comes from the bumpy, textured surface that resembles an egg crate. While some egg crate toppers are made from higher quality memory foam, most are made from a lower quality synthetic polyurethane foam. Egg crate foam is generally the thinnest type of mattress cover but they can be stacked to provide extra cushioning. Low-cost - Inexpensive foam is a good option for those on a budget. Portable - Egg crate foam is lightweight, and can be rolled up and easily transported. Versatile - It's good for camping, cots, rollaway beds or guest beds. Stackable - Egg crate styles can be stacked for thicker padding. Flimsy - Thinner than other materials, egg crate foam is not as efficient at providing pressure relief. Less durable - Low-quality egg crate foam is not as durable as latex or memory from and breaks down easier with frequent use. Heat retention - Can retain heat and may feel hot in warm weather. CarePathways offers egg crate foam mattress toppers in twin, full, queen and king sizes. Proper care and maintenance can help prolong the life of foam mattresses and mattress toppers. For any mattress or topper, a breathable, waterproof mattress protector helps prevent dust mites, bedbugs, mold and mildew. Keep body oils and sweat from damaging the integrity of the foam with a mattress protector. Memory foam mattresses often come with specialized protectors that don't inhibit body heat so the material can properly conform to the body shape. The layered construction of memory foam mattresses leaves only one side available for sleeping. Never flip a memory foam mattress and only rotate it 180 degrees if the manufacturer suggests it. Tempur-Pedic mattresses do not require rotating or flipping. Vacuum the mattress frequently to reduce allergens. If a wet spill occurs, strip all the removable bedding at once and soak up as much as you can with dry towels. Use a solution of mild detergent and water to remove any stains and allow the foam to dry completely before replacing the bedding. Use the same methods of vacuuming and spot cleaning to care for a latex foam mattress or mattress topper. Refer to the manufacturer's instructions with regards to flipping or rotating a latex mattress. FloBeds says you do not need to rotate their mattresses, which come with customizable layered cores you can rearrange as needed. WJ Southard says to flip and rotate their mattresses to encourage even wear and minimize body impressions. A firm foundation, such as a platform bed frame, is necessary to properly support a memory foam or latex foam mattress and prevent it from sagging. Consult with your mattress manufacturer to ensure you have the proper bed frame, otherwise it may void your warranty.